THESE CUSHIONS ARE FOR INDOOR USE ONLY. 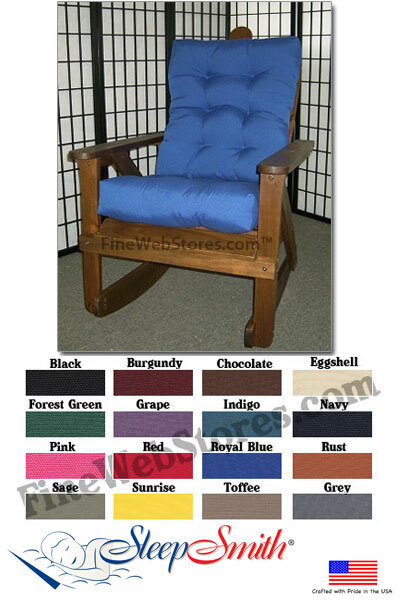 Adirondack chair cushions can be hard to come by but we manufacture awesome ones. Our rocking chair cushions are made from 50/50 cotton/poly duck. This is a fairly hard canvas type material which looks GREAT, wears like iron and comes in a great selection of colors. Solid long wearing cotton/poly duck. Filled with soft poly fill. The seat cushion is 18" x 20"
The back cushion is 18" x 24" with some narrowing to the rear. Cushions come with ties to secure to rocking chair. 95% of these ship within 10 days plus transit time. FOR CLARITY SAKEThese are cushions only, you do not receive the wooden chair. The Adirondack Chair Cushion Set Duck Fabric is made from 50/50 cotton/poly duck fabric.